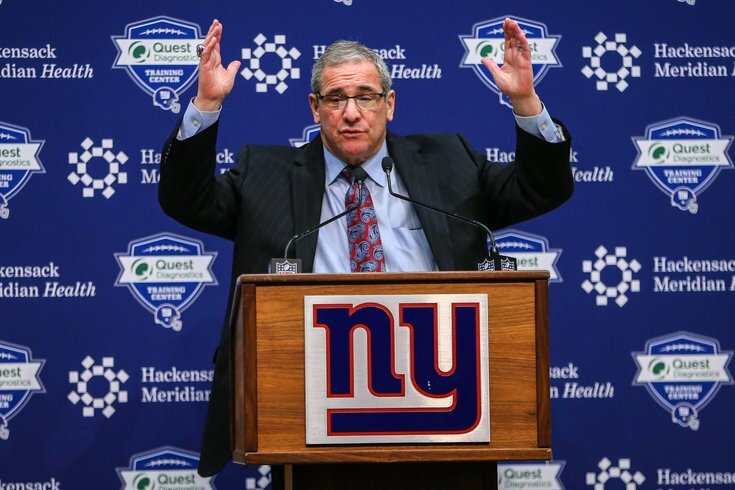 The Dave Gettleman era in New York will be fun to watch, no matter how it all turns out. After focusing on the Philadelphia Eagles' draft since last Thursday, let's take a look around at the rest of the NFC East, one team at a time, starting with the cellar dwelling New York Giants. Round 1: Saquon Barkley, RB, Penn State: Barkley is obviously a great player, and he could pay immediate dividends for a bad Giants offense. He has it all. He's fast, strong, he can catch, run inside, run outside, pass protect, and by all accounts he's a good kid. But, as we noted after the first round of the draft, it's just an atrocious use of resources to take a running back with the No. 2 overall pick, for a lot of reasons, most notably that they have extraordinarily short shelf lives in the NFL. We won't beat that dead horse any more than we already have. Round 2: Will Hernandez, OG, UTEP: The Giants seem to be transitioning from a pass-heavy team to one that is going to try to pound the run. Hernandez is a mean, nasty human being who moves defensive linemen in the run game. The Giants have holes galore on their offensive line, and Hernandez will solidify one of those spots. This is a really good pick for what the Giants seem to want to do offensively, though what they may want to do offensively may not be the best idea. Round 3: Lorenzo Carter, Edge, Georgia: At 6'5, 250 with a 4.5 40, Carter is a size-speed freak, and a former five-star recruit out of high school. However, his sack numbers at Georgia were unimpressive. In four seasons there, he had just 14 total sacks, though he does have upside. In James Bettcher's aggressive, blitzing 3-4 scheme, Carter makes a lot of sense on the edge. I thought Carter would be a second round pick, so I like his value in the third round. Round 3: B.J. Hill, DT, Clemson: NC State's defensive line was absolutely loaded with talent in 2017, making it difficult for Hill to stand out. While Hill is athletically gifted and more of a disruptive type than a stout point of attack guy, he had just 8 sacks over a four year career, though there's upside potential. He is also thought to be deficient against the run, which could be problematic in a division with three excellent run-blocking offensive lines in the Eagles, Cowboys, and Redskins. Still, for what it appears the Giants are trying to build defensively, he makes sense in their scheme. Round 4: Kyle Lauletta, QB, Richmond: In 2017, the Giants drafted QB Davis Webb in the third round. If the Giants had, say, 10 picks in this draft and they took a quarterback, I probably wouldn't bat an eye. Because they only made six picks on a roster full of holes, it's a pretty strong indication that this new Giants regime is not sold on Webb. Lauletta is about what you would expect of a fourth round pick. He has some nice traits (accuracy, smarts, leadership qualities), but is hampered by the lack of arm strength. In the NFL, he's going to have to rely on pin-point accuracy and timing, which is not easy. In some ways, he reminds me a bit of Matt Barkley coming out of college. Personally, this is not my cup of tea in a developmental quarterback, because what's there to develop? He already has the smarts and good mechanics, while his arm strength is not going to get substantially better. Backup quarterbacks are important, as Nick Foles showed last year, but in my view, "good backup quarterback" may be Lauletta's ceiling. Round 5: R.J. McIntosh, DT, Miami: This offseason, the Giants added Kareem Martin (6'6, 272) as a free agent from Arizona, where he played under defensive coordinator James Bettcher. McIntosh (6'5, 286) is athletic for his size, and feels like a fit in that scheme, where I imagine he'll play behind Martin. Nice Day 3 pick. The Giants' draft was widely praised by pundits. I don't see it that way at all. I thought the Giants made a number of nice picks on the defensive side of the ball, with players who should fit in nicely in James Bettcher's aggressive, blitz-happy scheme. Additionally, if you can overlook the questionable plan to build your offense around the run game in the modern NFL, then Will Hernandez was a nice value early in the second round. Ultimately for me, however, this draft was all about the No. 2 overall pick. The Giants weren't "in love" with any of the five quarterbacks who were taken in the first round of this draft. Do they all have their various warts and/or concerns? Sure, but so did every other quarterback not named Andrew Luck who was drafted in the first round over the last two decades. I say this all the time, but in the NFL, you either have a quarterback, or you don't, and if you don't you have no chance. The Giants seemingly believe they can win now, with a 37-year old Eli Manning and a Swiss cheese offensive line. That's delusional. Saquon Barkley is indeed an incredible talent, and I'm certain he'll have his beastly moments, which will undoubtedly provide "I told you so" moments for the folks who think that drafting a RB at No. 2 overall is a good idea. In the end, I simply can't get past the notion that there's a general manager employed by an NFL team who thinks that positional value is "a crock."